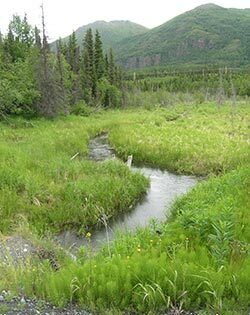 This recreation site offers good access to the Kenai River between the Russian River and Skilak Lake. Scan the trees for bald eagles and belted kingfishers, and watch for Arctic terns and gulls as they swoop for food. Harlequin ducks and other waterfowl paddle along the edges. American dippers work the shallows, while fox, song and white-crowned sparrows and other songbirds forage through the alders and willows that line the river banks. Moose appear at the river edge early and late in the day. Brown and black bears, as well as bald eagles, can sometimes be spotted. Alder flycatchers and northern waterthrushes have been reported in the slough along Jean Creek on Skilak Lake Loop Road, about 30 yards past the Jim’s Landing entrance. Wetland and riparian habitats are found here. A very strong main channel is rimmed by backwaters that change with rising or falling water levels. A mature forest dominated by white spruce lines the banks. The landing was originally established by miners to access claims across the river. It’s now a very busy boat launch for fishermen and guides working the upper Kenai River. In the early spring isolated pools on the Kenai River floodplain often contain juvenile coho and Chinook salmon. Parking areas close to the river can be full during the height of fishing season. Stay behind the fence that protects the riverbank revegetation in the area. Cold, fast water leading to a narrow Class III river canyon is for experienced non-motorized boaters only. Sterling Highway milepost 58, take Skilak Lake Loop Road south. Jim’s Landing is a few yards ahead on the left (south).